Johnny Lattner won the Heisman Trophy in 1953, given to the nation’s most outstanding college football player. 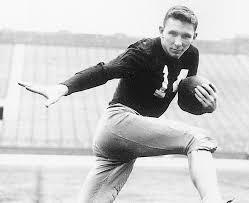 He twice won the Maxwell Award given to the College Player of the Year in 1952 and 1953. Lattner was born in Chicago in 1932 and starred in both football and basketball at Fenwick High School in Oak Park (class of 1950). After graduating, he enrolled at the University of Notre Dame where he continued his football success. The two-time All-American was the only player chosen for both the offensive and defensive teams. Although listed as a halfback, Lattner was a versatile player on both sides of the ball. He not only ran the football and caught passes, but also punted, returned kicks, passed, and had 13 career interceptions. His school record for total yards gained (rushing, pass receptions, and runbacks) was not broken until 1979. Known for his clutch performances in big games, Johnny Lattner held numerous Notre Dame offensive and defensive records. Drafted in the first round by the Pittsburgh Steelers in 1954, Lattner’s pro career was short-lived due to a knee injury he suffered in a military game while serving in the Air Force. John J. Lattner is a member of the Fenwick High School Hall of Fame and was inducted into the College Football Hall of Fame in 1979.